Her: What did you do yesterday? Boathouse? Can’t wait to see your blog post. Her: WHY WON’T YOU RESPOND TO ME!?!?! OK, so I’ve been a little lax about the blogging part of co-running a blog. I did make that blog header, though, so… props to me, right? Anyway, I’ll start off with something cool I found today. After living in my apartment for a year (and recently re-signing the lease), I figure it’s about time to do a little sprucing. And by sprucing, I mean pulling out the poster frames that have been sitting on the floor in the corner between the bookshelf and the wall, and maybe even getting some actual art ON the walls. We recently put up curtains in the living room, so we’re movin’, bebe. Those who know me know that I never buy anything full price and don’t like paying for something I can get for free. So I’ve been poking around the Internet trying to find free, downloadable wall art that doesn’t have cheesy sayings like, “Dance like nobody’s watching.” I was excited to find Stamen, an open-source site with some seriously cool map treatments. 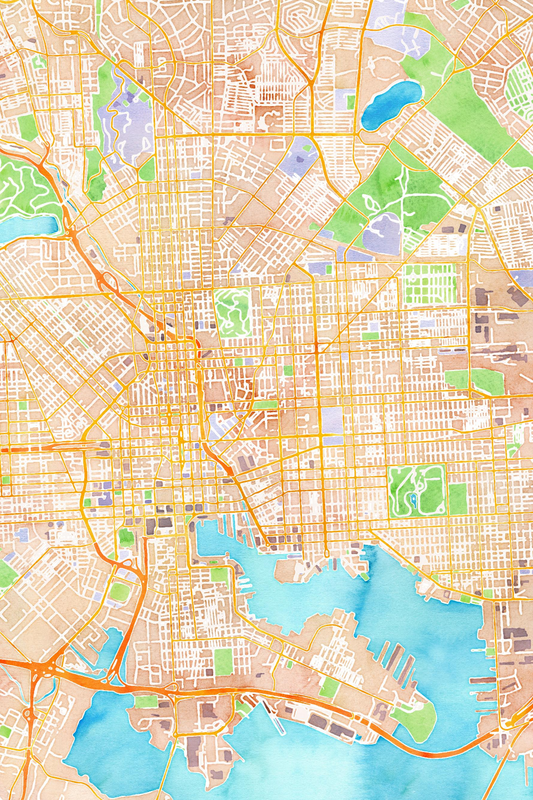 Basically, pick a style, type in your ZIP code and up pops a map pretty enough to frame. I did a watercolor-style treatment to a map of Baltimore. Save the image as a jpeg, print, frame, and voila. The poor (wo)man’s Etsy art.